Alternate titles that came to mind: The Aftermath. Or: Waste Not. …I am not complaining. The things that are labor-intensive and love-intensive just take a lot of time. 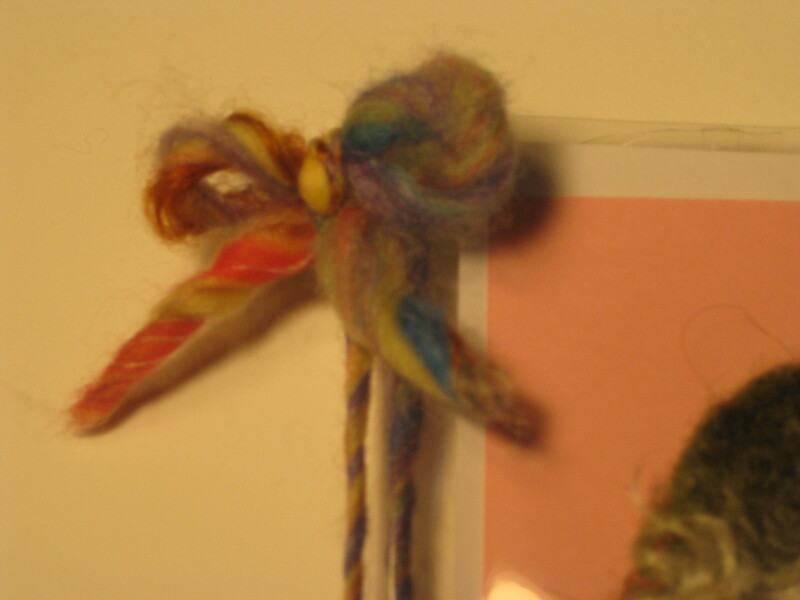 Here are three photos that show a Rhapsody Rose Corsage Pin: out of the package, in the package (pardon the glare off the plastic card “sleeve”), and a close-up detail of the little bow I fashioned from some of my hand-spun yarn that embellishes each package. I hope they convey some of the energy and vitality of hardy spring flowers — some that are now blooming and others just peeking up through the earth in my garden — even though as I write this, it’s actually snowing. Can a flower be described as “fearless”? 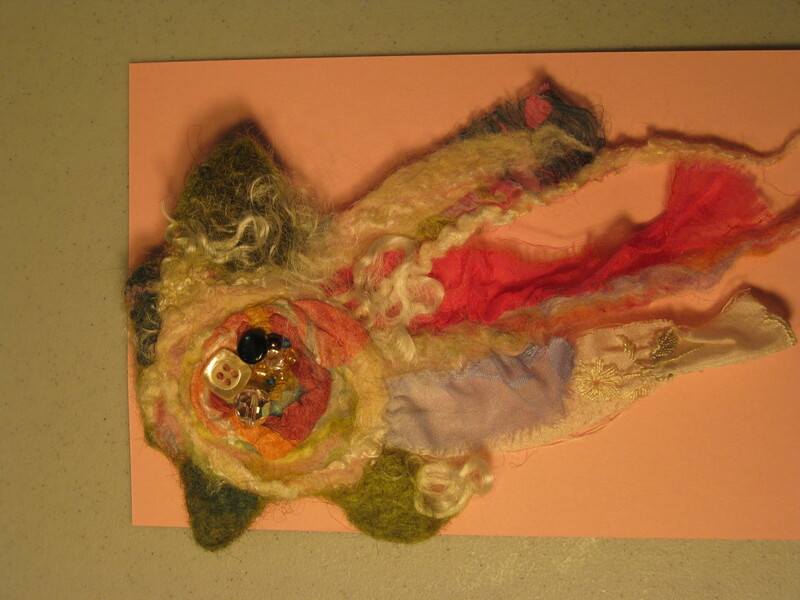 How much healing and optimism can be offered up in a small labor of love? I hope my work makes you smile. 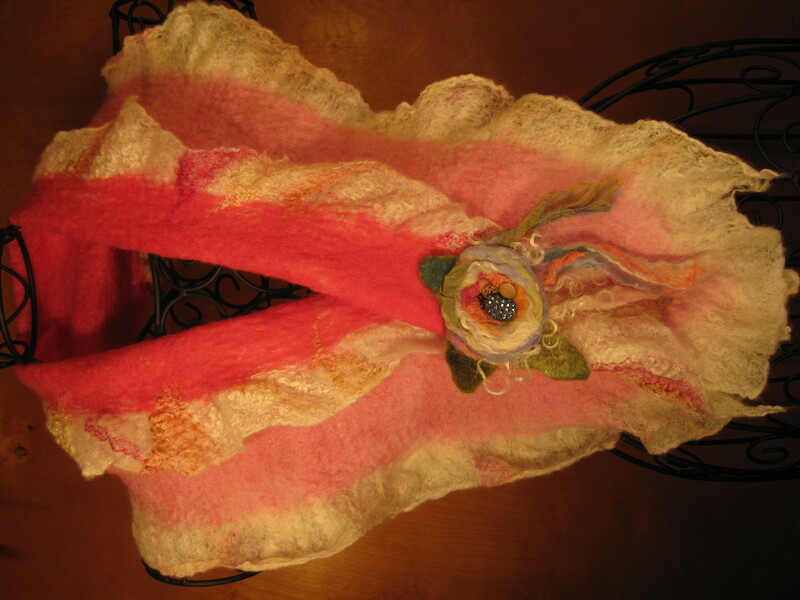 This scarf is so light-weight, it’s almost a “cobweb” felt; but the mid-layer of this silk/merino/cashmere provides delicate softness, graceful drape and supple strength. 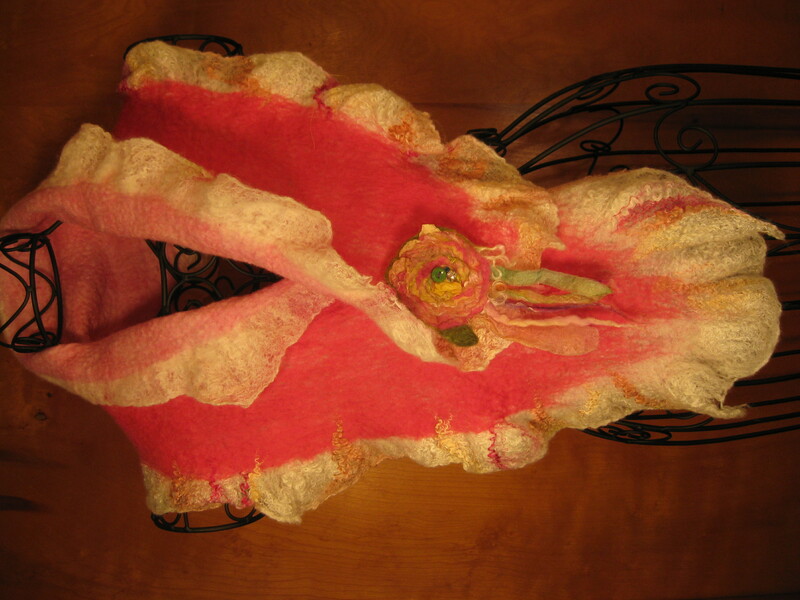 It’s double-sided: soft pink on one side, and deep rose on the other, with delicate silk fibers embedded into the ruffles all around the edges. 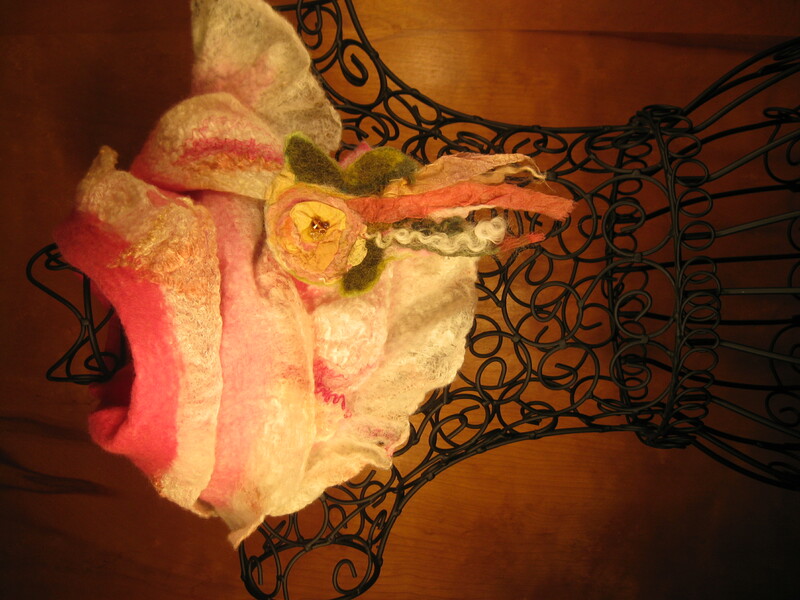 The photos show different ways of arranging the same scarf with a few different “Rhapsody Rose Corsage” pins. 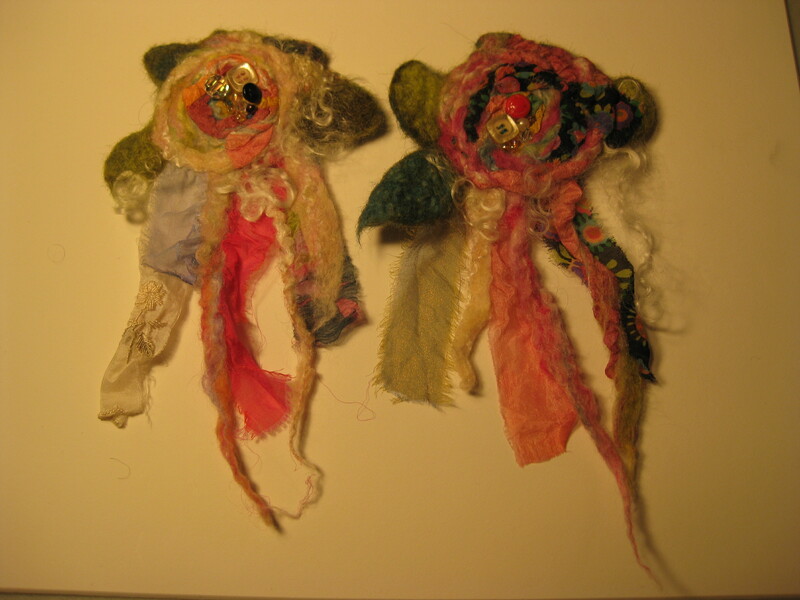 After being felted, then individually fulled, and beaded with a variety of vintage buttons and beads as well as some glass beads, six “Rhapsody Rose” corsages are ready to have pin backs carefully stitched on. I love creating them and I love how they make people smile. 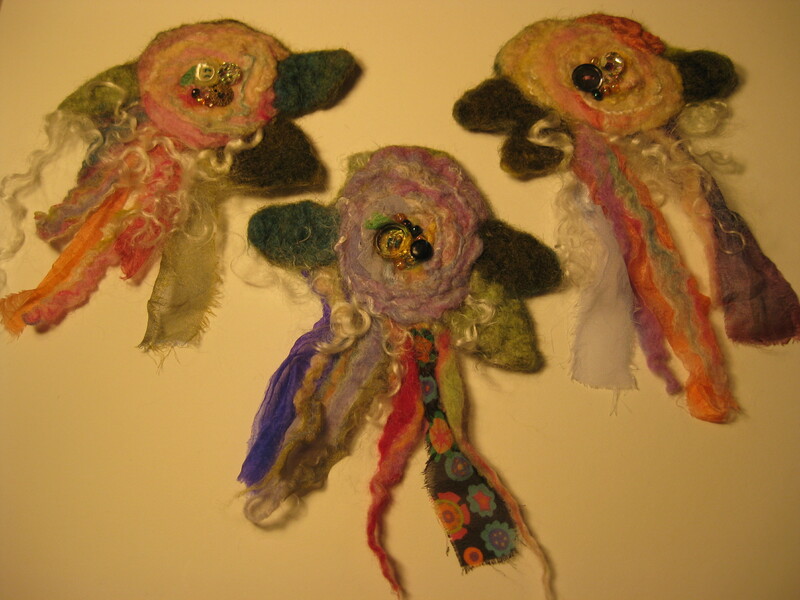 Here are the not-yet-felted pins, all fluffy and layered and waiting to be covered, wet, felted, cut into shape and fulled; then beaded and finished with pin backs. 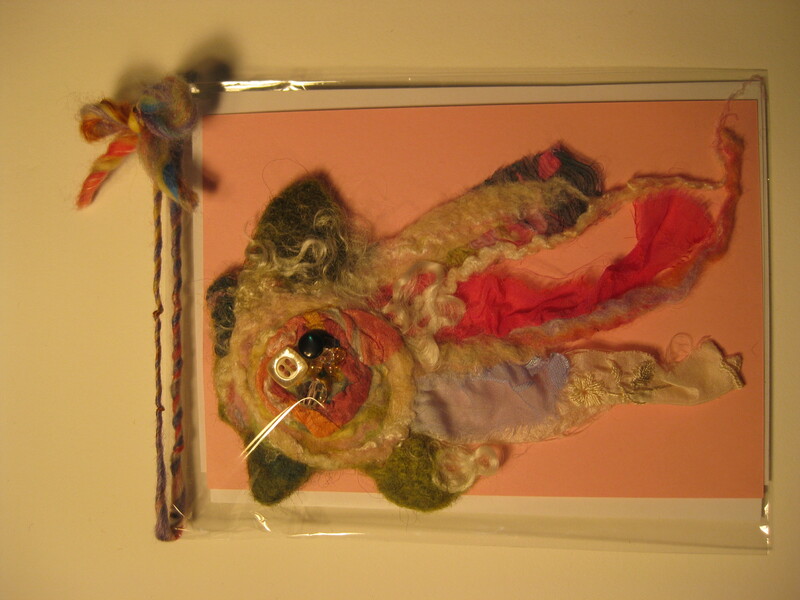 If you click on the photo you can see the various fibers and fabrics, as well as those curly, shiny kid mohair locks. 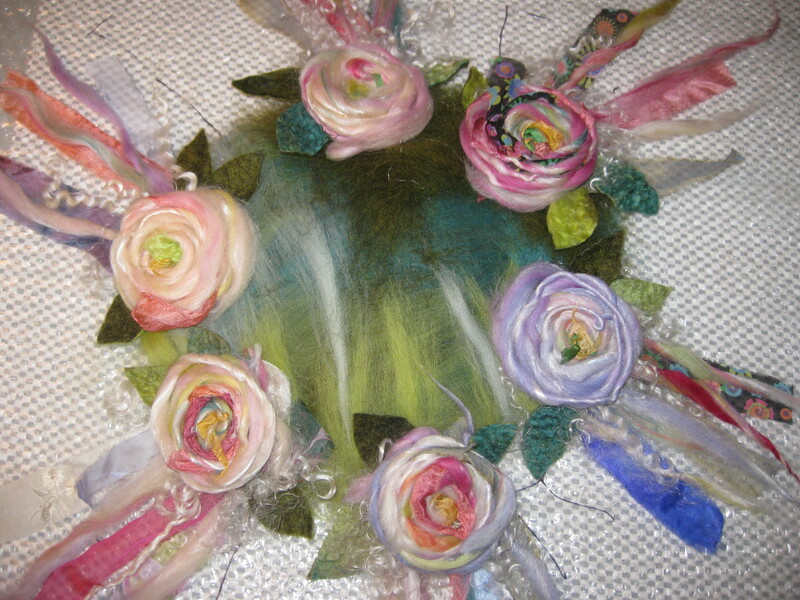 The image above shows the start of laying out fibers for some “Rhapsody Rose Corsage” pins. 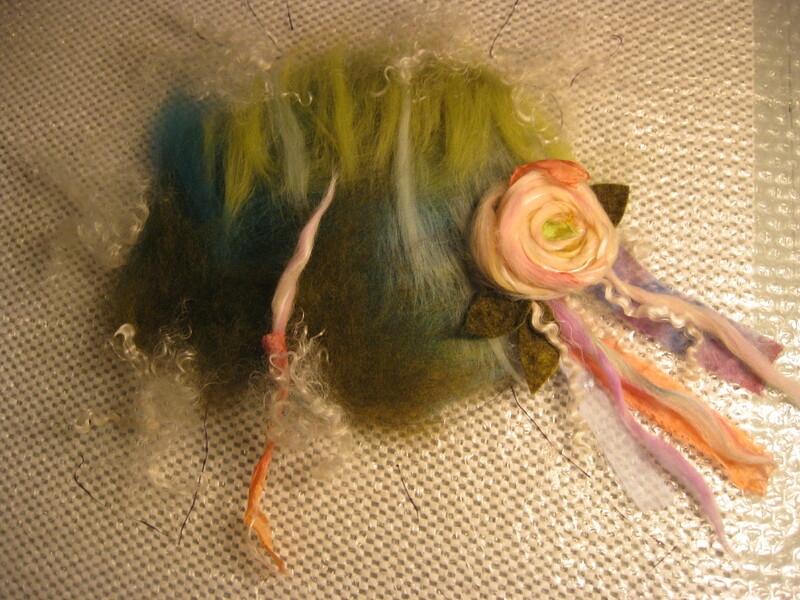 In the center of my workspace, I’ve arranged three layers of various fibers, including several green colors of merino wool and a fluffy Finn wool in deep moss green, on top of bubble wrap that’s placed on top of some plastic shelf liner to keep the bubble wrap from sliding on my work table. These fibers provide the base for the flowers, as well as providing some green “prefelt” yardage from which I’ll cut leaves for other work. 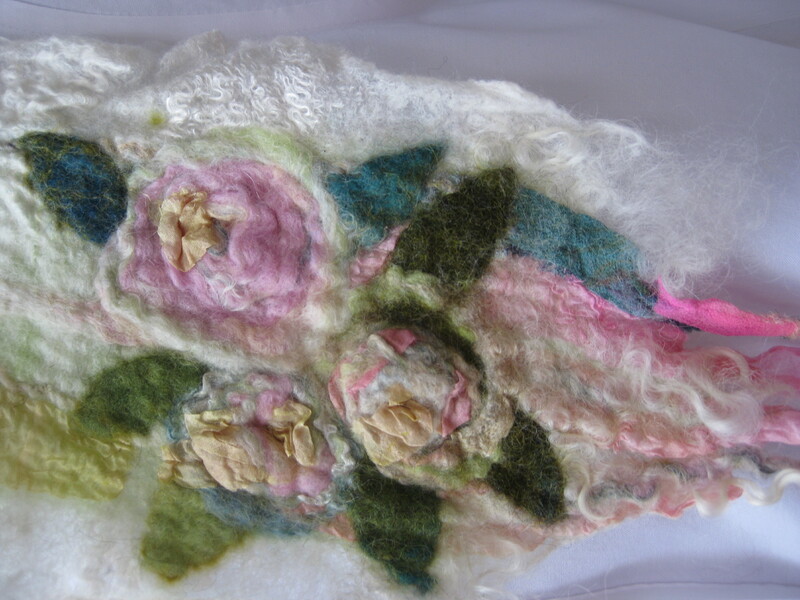 On top of this green layer, I place strips of silk fabric, including some of the silk fabrics from MOOD. 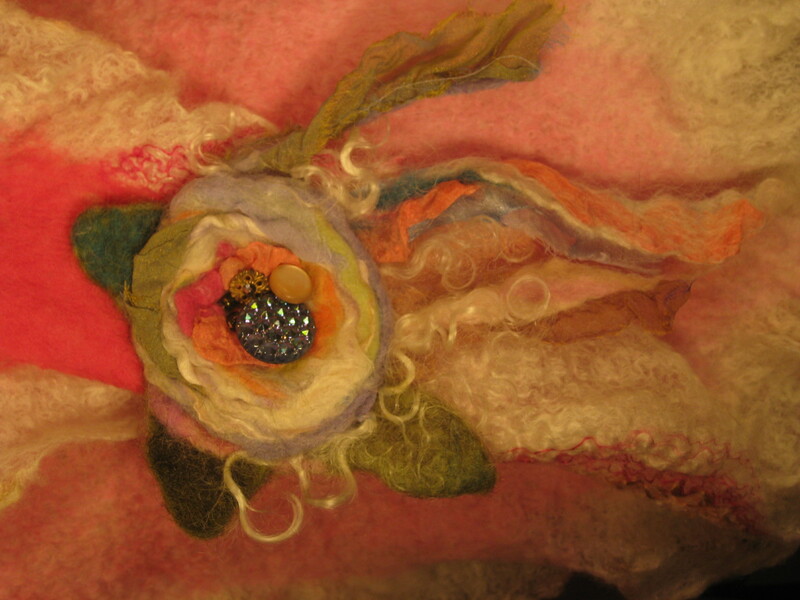 I nestle tendrils of curly kid mohair locks and my hand-spun yarns to overlap the strips of silk fabric; then cut leaves from green “prefelted” yardage I’ve previously made and arrange these leaves on top of the other elements; and finally I fashion a rose from some of my hand-spun and a few bits of silk fabric strips &/or some wisps of merino fiber, and place the rose on top. 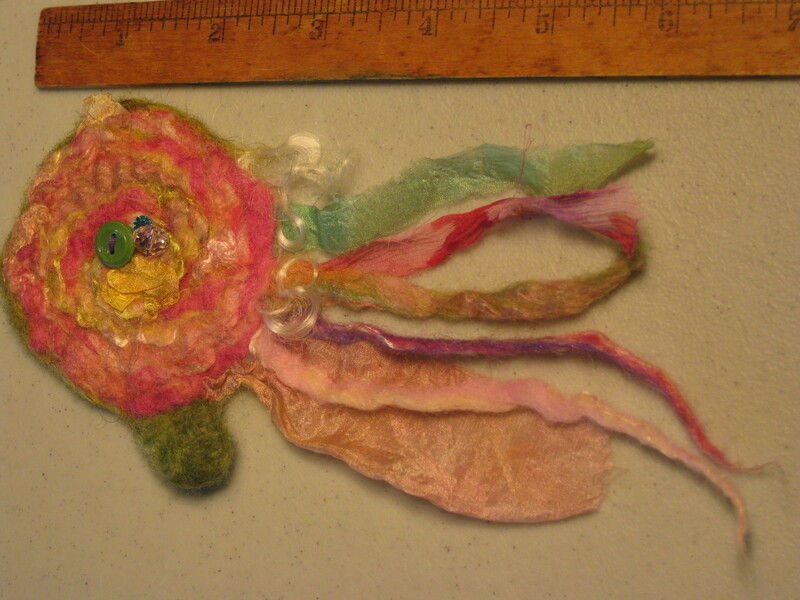 I’ll craft four or five closely-spaced designs in this layout, then cover/wet/felt them. 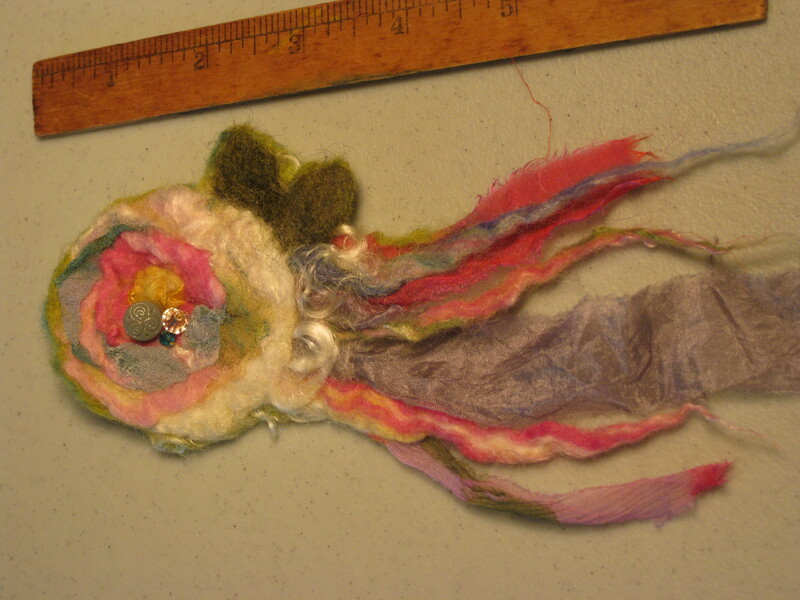 I’ll carefully cut out each “corsage” while the fibers are still wet. 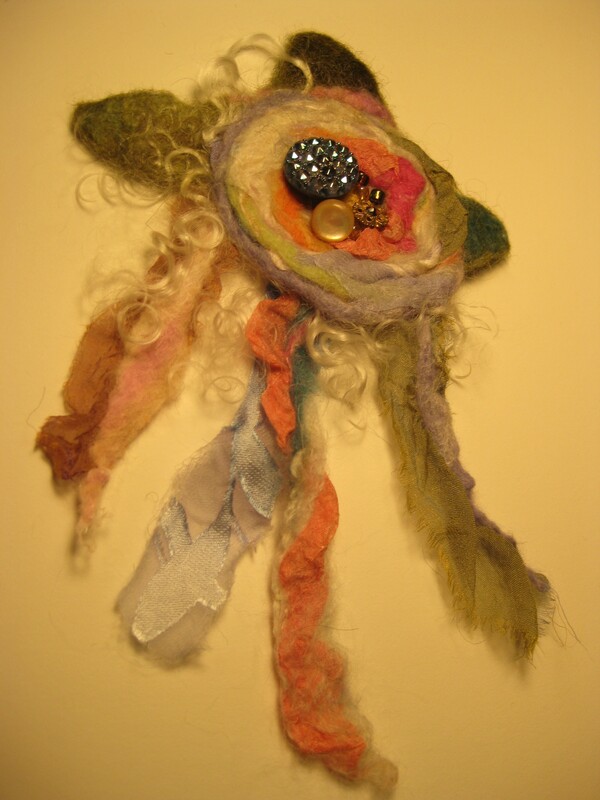 Finally, I’ll “full” (work to shrink) each Corsage individually, and gently coax the various elements into final shape. 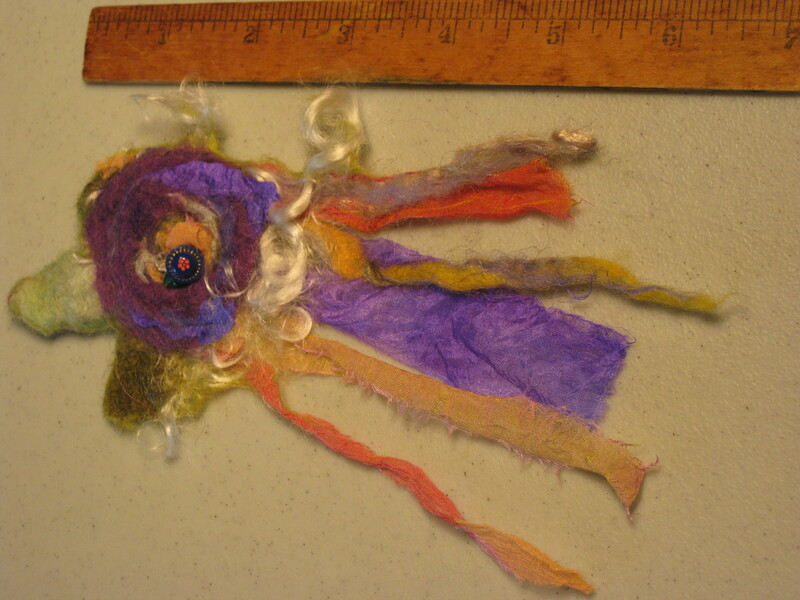 Inspired by these four, half-yard cuts of silk, I gathered fibers to card and spin into art yarn. 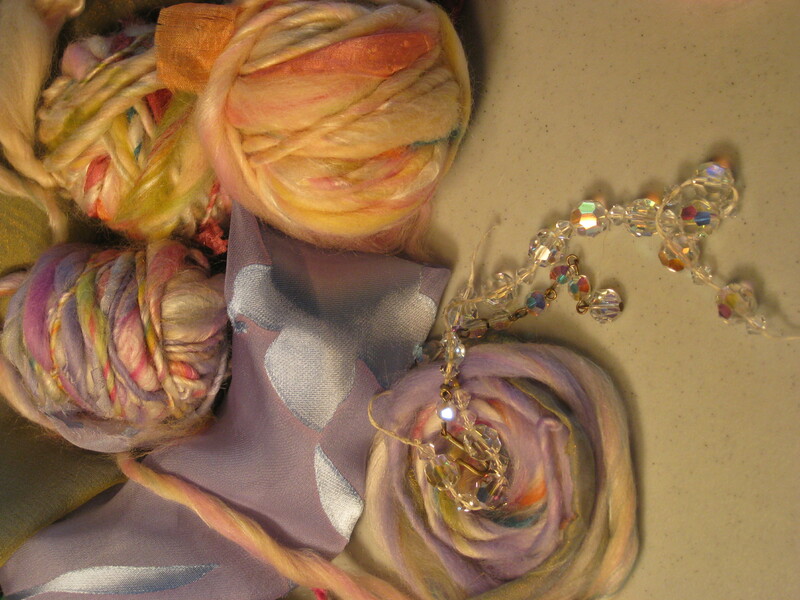 The above photo shows yarn that incorporates strips of the “burnout” lavender silk and iridescent gold/pale blue silk chiffon fabric. Sparkling next to the just-spun yarn, a string of vintage crystal beads I recently found at Apple Hill Antiques in State College, PA. 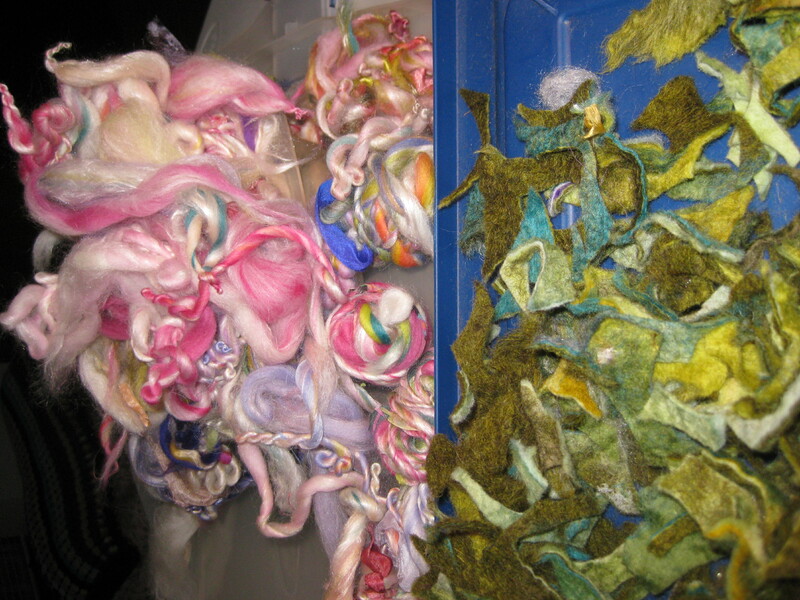 The third photo, above, shows the medley of yarns I spun that were inspired by the four MOOD silk fabrics. 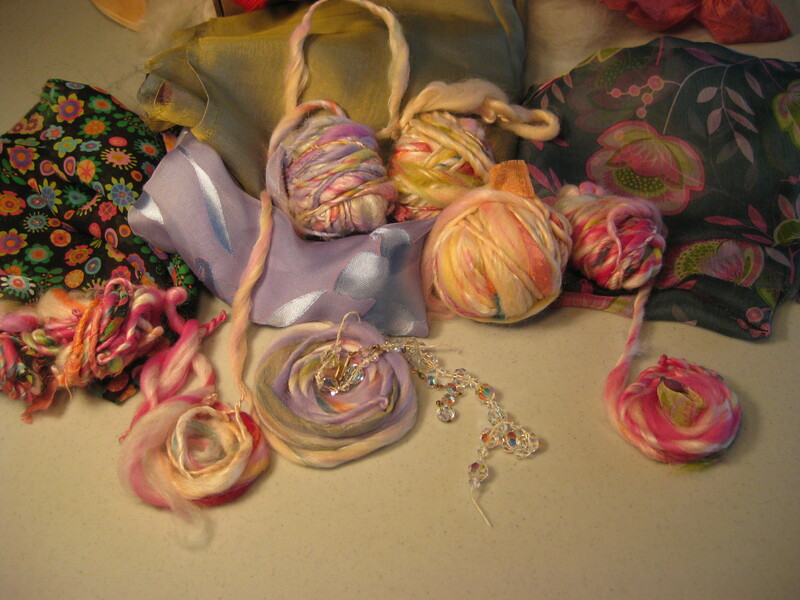 In the coming days I hope to post images of how these yarns will be transformed into felted scarves and “Rhapsody Rose” corsage pins. 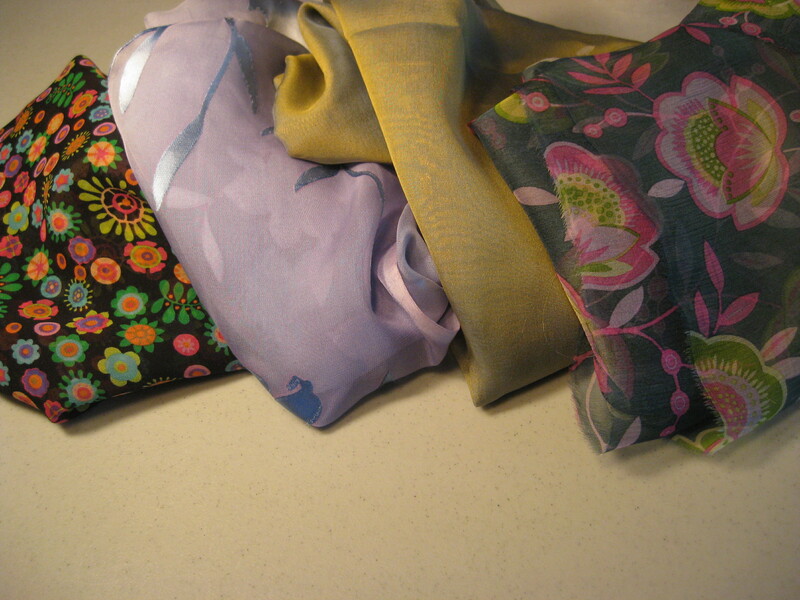 I’m grateful for the amazing and affordable fabrics at MOOD, and for the people who work there, who make shopping for fabric such a pleasant experience. Working on the current “Rhapsody Rose” series has been instructive — and as I’ve experimented with varying type, color and amount of different fibers, sometimes the result shimmers with an opalescent quality of movement and reflection of light. 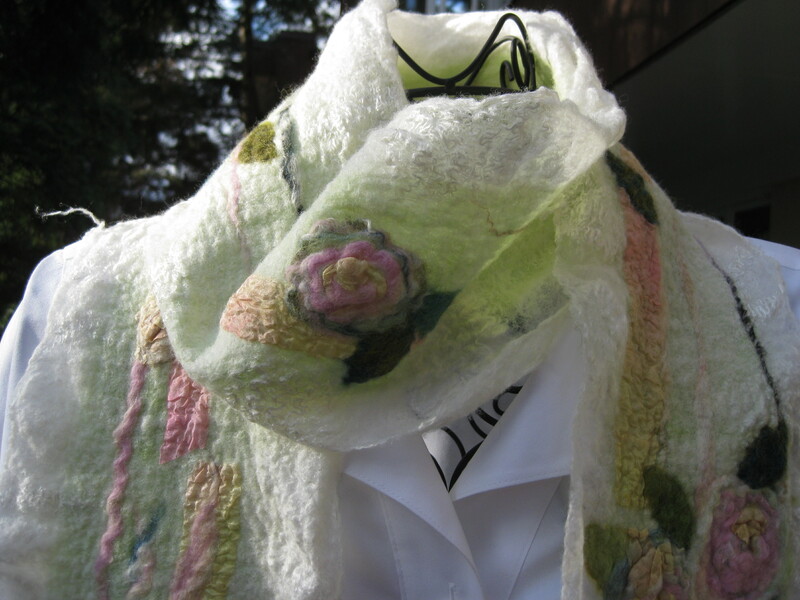 An abundance of silk and cashmere brings a quality of weightlessness and delicate softness to the drape, so they are silky rather than bulky, and they do not add much warmth when draped loosely; but these scarves when wrapped close are cozy and warm, and in this way they’re very versatile. 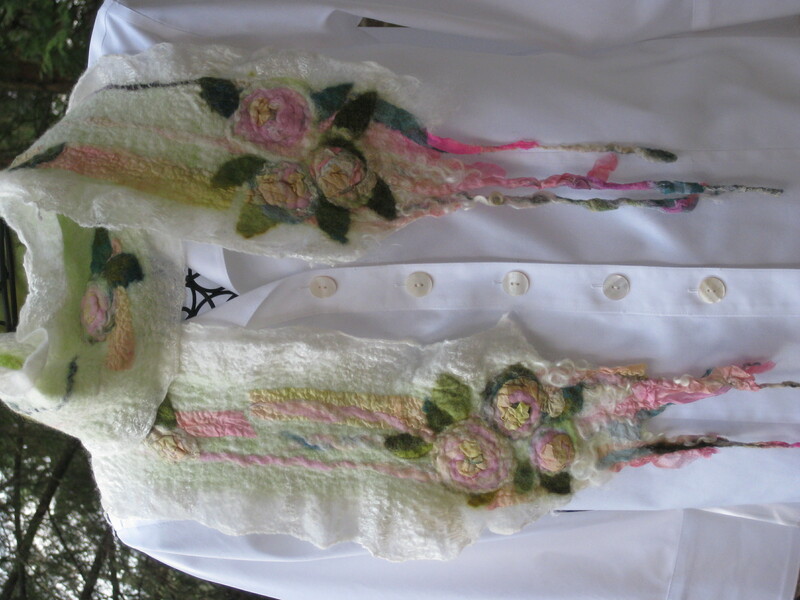 I’m aiming to create some Rhapsody Rose scarves that will have this opalescent quality and a shimmering radiance of different colors.